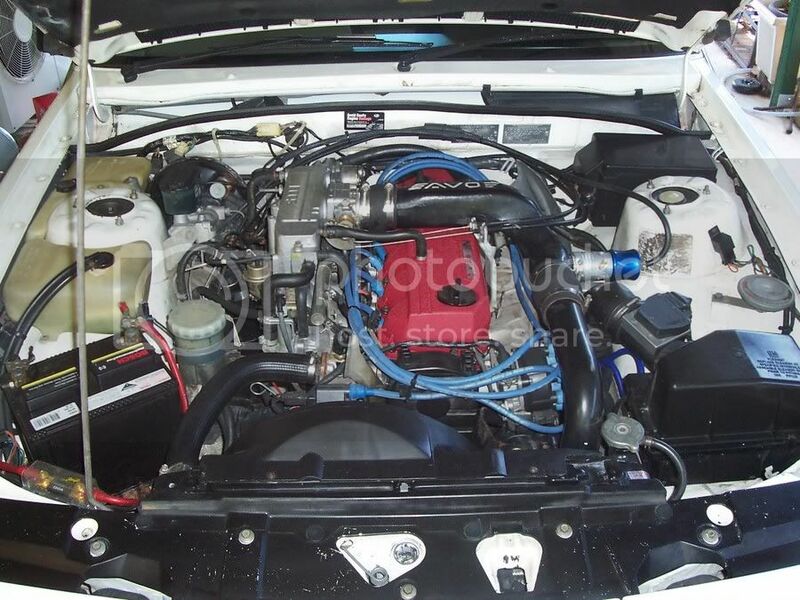 Here is my guide explaining how to respray your VL turbo rocker cover. 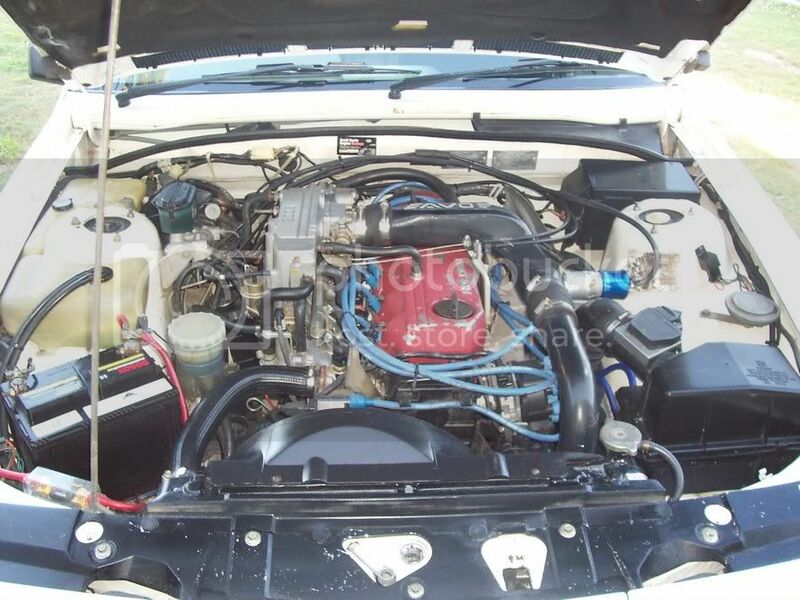 Take off the intake pipng and undo the vacuum lines neccesary to remove the rocker cover. You might also need to unbolt the bracket holding the throttle cables in place to get it out of the way. Then Undo all the screws holding the rocker cover in place and remove the rocker cover. 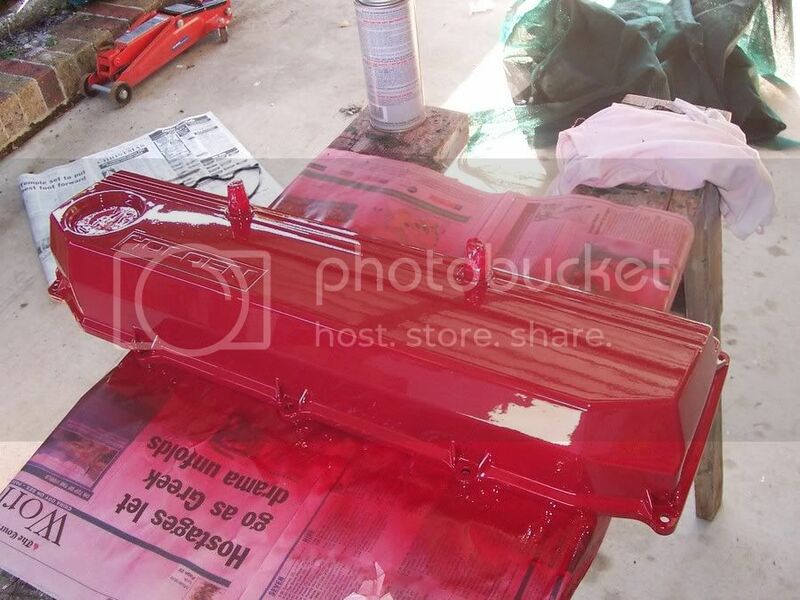 With the rocker off the car its best to put it on newspaper or an old dropsheet because you will probably make a mess with the paint stripper. Working in sections genorously apply the paint stripper with a paint brush or piece of cardboard to the area and let it penetrate for 10-15 seconds. Then using a plastic scraper or clean piece of thin cardboard scrape away the paint stripper and the paint should come with it. Do not use a metal scraper because the rocker cover is aluminium and will scratch very easily. 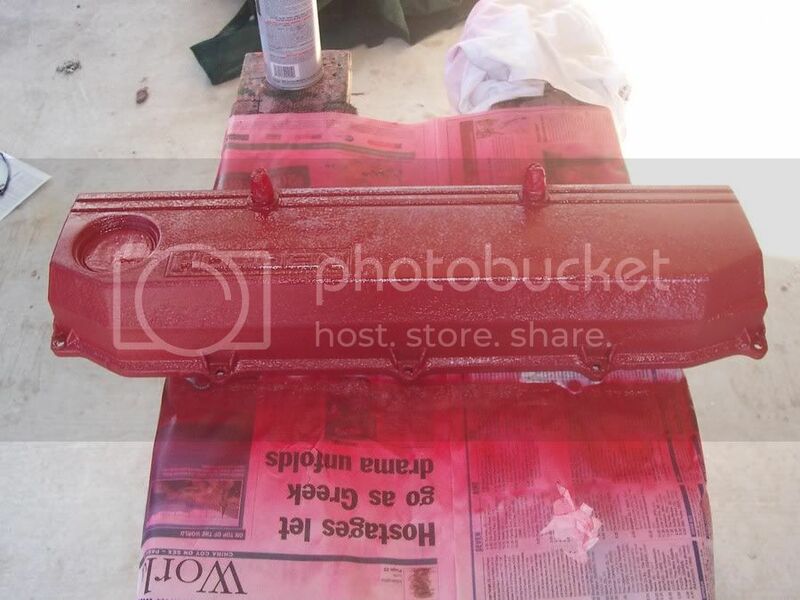 Continue doing this until you have covered the entire rocker cover and scraped off most of the paint. You may need to go over some ares twice to get as much as you can out of the grooves and around the lettering. 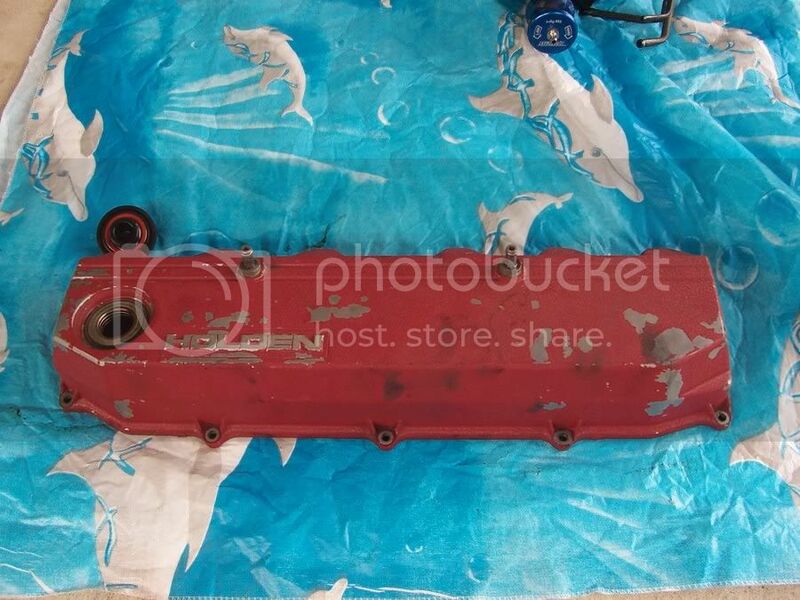 Give the rocker cover a hose off to get all the excess paint stripper and crap off it then get some wet and dry P600 wet and dry sandpaper and sand back all the little spots that the paint stripper didn't get off. To get in the hard to get places you may use a wire brush to loosen up all the paint thats stuck there but be very careful beacause as mentioned before it will scratch very easily. I mainly used the wire brush in the places where you will not see it as much. You may want to apply a bit more paint stripper to these areas which will make it easier but make sure it is dry otherwise the paint stripper will not work. Once all the paint is off give it all a light sand with the P600 sandpaper and thouroughly dry it off. Mask off the two breathers as well as the part where the oil cap goes with masking tape. 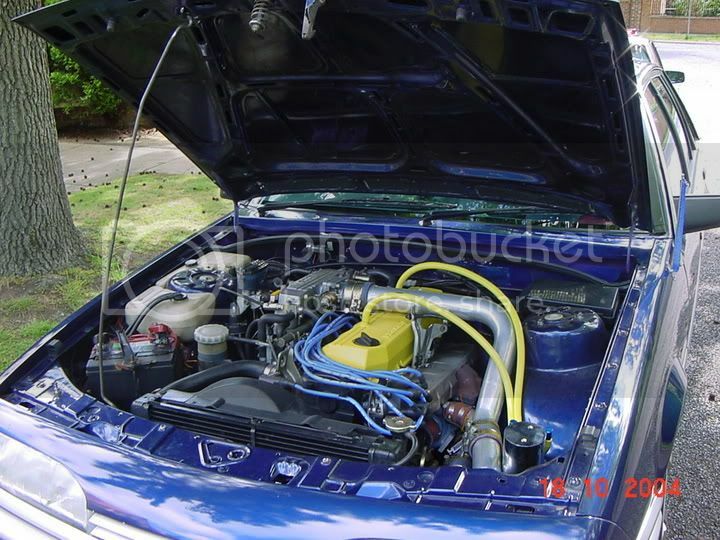 Prepare the rocker cover by wiping it down with some wax and grease remover using a clean rag. Apply a decent base coat of paint to cover all of the metal then give it about two minutes sit. Then apply two more light coats of paint to finish it off leaving if for two minutes between the coats. You may want to apply more coats but I wouldn't reccomend it if you want to achieve a factory look finish. The more paint you apply the bigger the wrinkles in the paint will be. Get out the hairdryer and go over the paint for about 20-25 minutes. This will help the paint to set and cure it so it won't chip off in the future. During this proccess you will see the paint start to wrinkle. Leave it overnight to completely set before the next step. 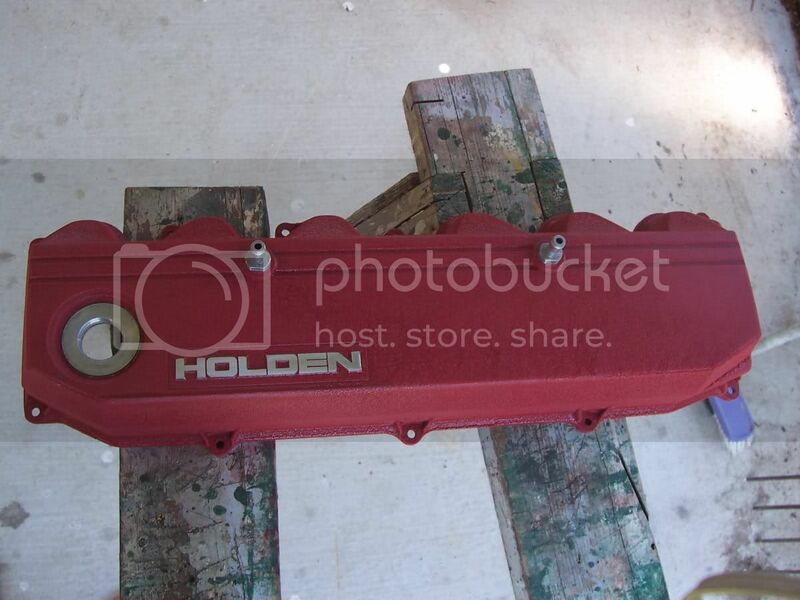 Remove the masking tape and get a sanding block to sand the paint off the top of the "HOLDEN" lettering. P320 works well and leaves a nice pattern in the metal without scratching it too much. Bolt it all back in being careful not to scratch the paint off the rocker cover because it might not have fully cured. The heat from the engine will do this as it will get pretty hot. Your engine internals looks clean, the roller rockers are normally black full of oil stain if you dont change your oil regularly. That VHT wrinkle paint is funny isnt it ? It looks like bright red paint but when the sucker drys complete the wrinkles form. When I first painted mine I thought sh*t how come no wrinkles ? 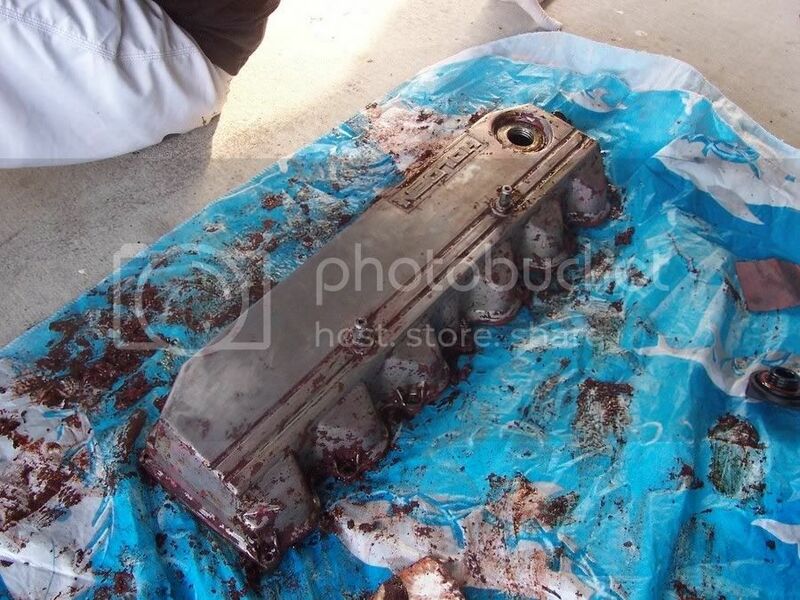 Anyway I left in over night and the next morning it was crazy it looked like a new rocker cover. Nice article and excellent work mate. "the look on the dude in the skyline's face when you boost past him WoKSTyLE, priceless :p"
Thanks mate, yeah it made a huge difference, hope it helps everyone. Also, I've found the spray can's of stripper worked better for me, seemed to rip up the paint a lot quicker. I used a high pressure spray to blast the paint off as well - worked really well. good guide, but why does it look so flakey? ?like the paint finish looks rough instead of smooth? is it coz of the canned paint? It's the paint ("Spray Paint (VHT Wrinkle Plus - Red)") - I'd say they were done like that out of the factory (I wouldn't know, don't have a turbo ). I would assume you wouldn't have to use "wrinkle plus" if you didn't... I think it looks nice though. An alternative to sanding off the paint on top of the 'Holden' bit is to mask off the top surface. This is a bit fiddly to do but works quite well as i have done both my rocker covers this way in the last year. Use one strip of masking tape accross the top of the lot then trim it off using a small sharp knife running it along the sloped side walls of the lettering. The masking tape can be removed with the aid of the knife again to help peel it up. 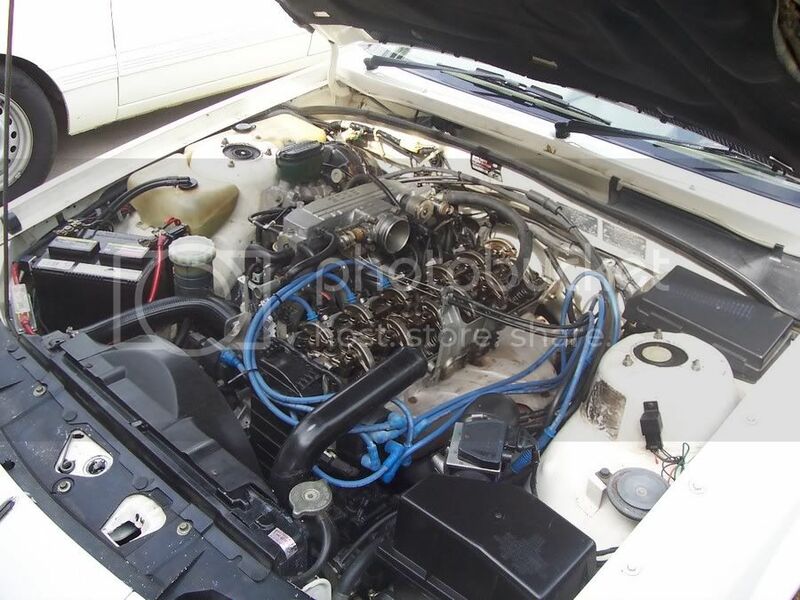 This can be done once paint has fully dried weeks after install or as soon as the rocker cover has been placed back on the motor and before the crossover pipe and throttle cables are reinstalled for easier access. 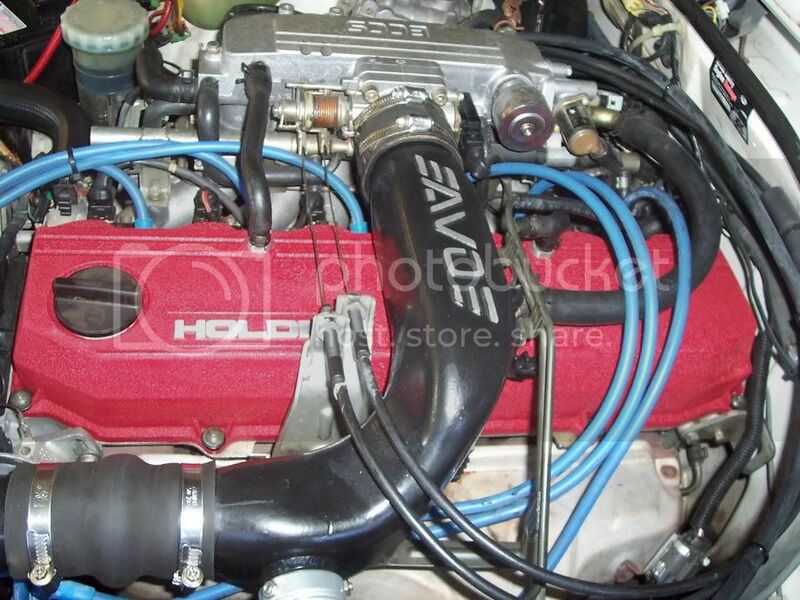 To finish it off Antho, paint the Exhaust manifold heat shield with VHT heat resistant silver should complete the job. Nice job Antho! 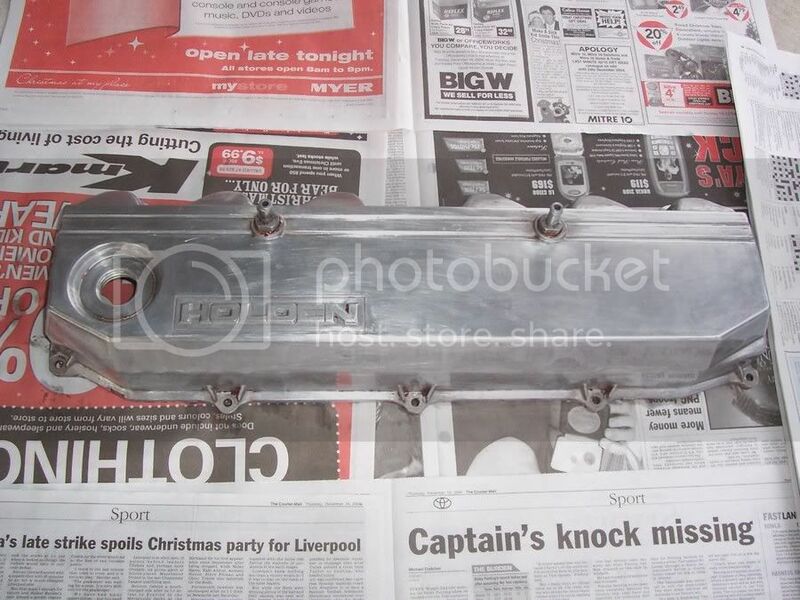 I've re-painted my rocker cover numerous times in solid colours, two tone etc.. It's all worth it when it's finished. Thanks for the article. Not trying to hi-jack your thread, but here's 2 jobs i did for myself just mucking around and trying things out. Might give someone an idea for two tone. Plenty of gloss shines them up really well. They are just acryllic spray paints. Last edited by white_vl_bt1; 24-12-04 at 18:28.
antho looks good mate, but why the **** would ya want a finish to look wrinkled????? i polished mine but that looks so good i might paint mine. nice work bud. i quite like the wrinkled finish on the stock/original looking car. that vht stuff seems to have worked well. so can ya take ya rocker cover off, paint it and bolt back on? i herd id loose compression or something ?? is this true ??? thanks . heheh i dont know where u heard that from mate but no, you wont loose any compression. u heard the biggest load of jizm ever ! its fine to take it off.. just be weary of dust and other abrasives settling on ur rocker gear... best to cover it over while the rocker cover is off. peeace.. lookin great fellas.. good article ! sweet, so just un hook all the ****, un bolt it, paint it then re bolt it all up, and all would be fine? also i take it ud ****in ya motor big time if it wasnt done up tight enough? 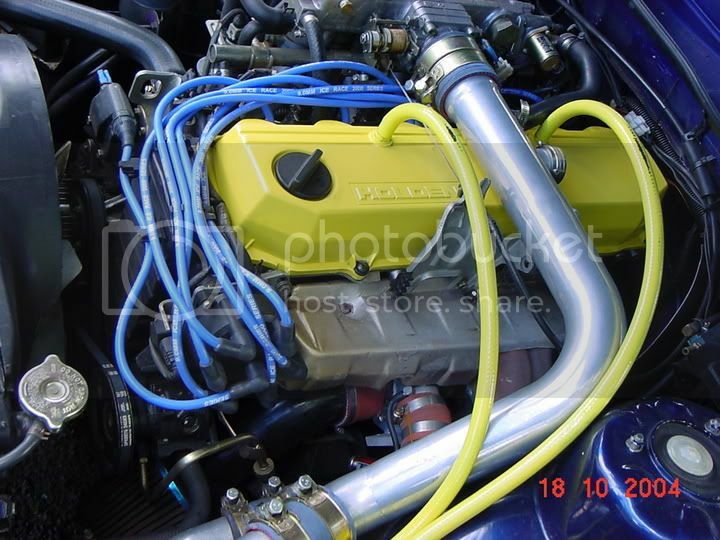 and what is the rocker cover made from? just mild steel?? if not, when uncovered will it rust ??? dont listen to them orange vl. if you let the air out of your rocker cover you will lose all compression and the engine will die a fast death! Orange VL are you genuinely trying to act and look stupid? Listen to what the educated people on the forum have to say and leave the magazine mechanics to talk their crap to each other. goto www.howstuffworks.com and begin educating yourself. The wrinkly red is lookin great fellas. Good to see some guys doin their cars up to the factory spec. 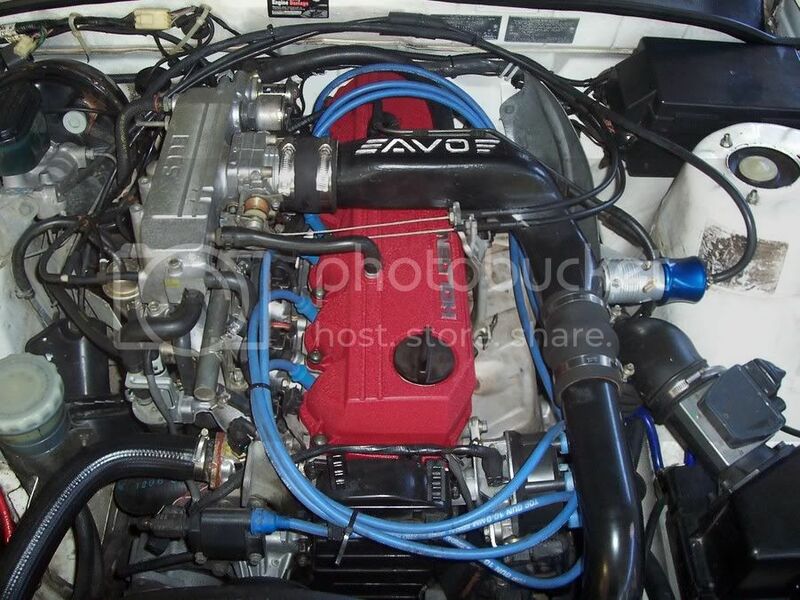 I'd like to do it to mine but since mine's n/a it'd be a bit wanky to pretend i have a turbo. Keep it up fellas. Nice work Antho, proves that the little things make a big difference..
this is mine, i like a smooth finish, looks good against the blue paint of the car i reckon. [URHYNS] - Sold and moving on.